You can adjust the level by adjusting the length of cable between weight and float. System switches on the pumping motor as and when water level in the tank falls below the lower level. Water level starts rising in the tank. As water reaches the upper level set by user, motor is switched off. Automatic water level controller with float switch sensor is the best solution for turning on and off water motor. There can be many applications of automatic water level controller such as in industries, schools, colleges, homes. from dry running: System is provided with the provision of monitoring the lower level of tank from where water is being pumped to fill over head tank. As and when water level in underground tank drops below lower level set by user, motor is switched off to avoid the dry running of motor. This is the best solution for Automatic Water Tank filling system. Cable Float Switch – Extra. Sensors: As shown in picture, sensors are the high grade plastic molded rolling ball float sensors. When sensor is in upright position, ball rolls down to indicate water filled till upper level of the tank. Similarly when sensor is in upside down position, ball rolls to other end giving indication that water level is dropped below lower limit in tank. This is the best water level controller for submersible pump. Output: 220V AC mains with 10 Amp relay contact for direct connection. Heavy loads: By adding external contractor or Relay load capacity can be increased to desired Levels like 10 A, 16 A, 25 A, 40 A, 100 A and so on. We have water level controller for Normal and Submersible Boring pumps. Single Phase Domestic Mono Block pumps – Model : WLC-SR.
Three Phase Domestic Mono Block pumps – Model : WLC-SR with external contactor / relay. Submercible / Borewell pumps – Model : WLC-DR.
We do sell Float switch for water level controller. Water Tank Automatic Filling System. We do export of this product as well. For importing this product from India do contact us. 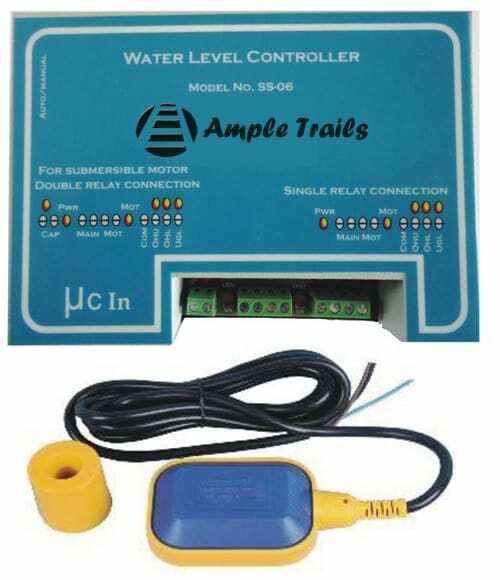 Get Automatic Water Level Controller in Delhi, Gurgaon, Noida.